Note: sum of the front & rear brackets' length must be less than 16.5" for your rails to be mountable in 16.5" racks. So Be Careful! our SR20 and SR26 CANNOT mount in 16.5" deep racks! See picture following for reference! Picture showing SR26-RET used on bottom 4U case! 6" deeper Racks available for $29 more(sum of brackets' length must be <= 22.5"), then our SR20 and SR26 CAN mount in 22.5" deep racks! 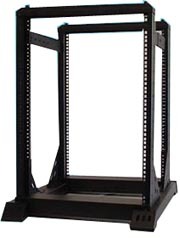 Ex: for 40U open rack, 40 x 1.75" + 5" =75" tall if buying no casters, but it is 79" tall if buying casters!